Hospitals can be challenging places to find space for quiet relaxation yet this may be just what the doctor ordered! Our WOW cart offers alternatives to television and newspapers by providing inspirational and relaxing CDs, audiotapes and books/audiobooks. Find music that suits your style or enjoy the soothing sounds of nature. Equipment is loaned free of charge with materials or patients may use their own. 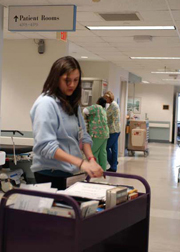 Volunteers make daily rounds. Ask your nurse if you have not had a visit.